Brett McMurphy's latest Ohio State piece is drawing attention for all the wrong reasons. Elephant in the room disclosure: I went to Ohio State and have recently moved back to Columbus. That said, I’ve been pretty consistently critical on social media, as well as on this site, about Urban Meyer and Ohio State’s handling of the Zach Smith situation. Additionally, I’ve also been pretty complimentary about McMurphy and his work, both here on the site and on social media. Brett McMurphy published another doozie of a story this morning on Stadium, his new home in sports media after a year plus of self publishing on Facebook while allowing his ESPN contract to wind down after being laid off last spring. The article is titled “The Search for the Truth About Trevon Grimes’ Transfer From Ohio State to Florida,” and early into the article, it looked like it could be a possible kill shot of Urban Meyer’s tenure at Ohio State. And honestly, at this point, a lot of Buckeye fans would be fine with it. However, that kill shot never comes, and while the article doesn’t draw too many conclusions and frames it as an investigation that never quite found a consensus, it’s ultimately extremely flawed and, in all honesty, just wouldn’t have been published at other media outlets. A quick summary of the article would be that McMurphy spent months looking into an allegation that disgraced former wide receivers coach Zach Smith had a confrontation with former Buckeye wide receiver TreVon Grimes and used a racial slur over the course of that confrontation. Grimes soon left Ohio State and would later officially transfer to Florida, his home state, under a hardship waiver. The article insinuates that Grimes was pressured by Meyer and other players to not publicly speak about the incident. Additionally, there is some uncertainty about his mother’s cancer diagnosis, which is what triggered the hardship waiver. Essentially, there are two things that are being presented in this story that initiated Grimes’ transfer from Ohio State. A racial slur was said at an Ohio State practice by a former coach. A silencing effort and coverup took place to ensure Grimes could leave Ohio State immediately and would not have to sit out a year as a regular transfer. Regarding the racial slur, Grimes, nor anyone at actually at practice this day, came forward and says this indeed took place. Not even anonymously. The only primary source here is Grimes’ dad, as well as a family friend that Grimes allegedly shared details of the incident with. The pair also cites another player who verified the story, but would not participate in the story. Additionally, it mentions some unnamed Florida players who reported to McMurphy that Grimes had spoken about the incident to them, but again, they were not present when the incident took place. As for players who did witness the incident in question, many took to Twitter to deny hearing any slur. It should be noted these players have remained largely silent in defending Smith as the other McMurphy reports have come out in recent weeks and months. McMurphy does present his source’s checkered pasts, but I, and many others, am left wondering if an entire story can be based on an individual with a troubled past, as outlined below. “As referenced in Leah’s statement, LeBron, 46, admits he has experienced his share of legal issues. Between 2011 and 2015, LeBron was the defendant in two domestic violence cases with two different women: his step-sister and Leah Grimes, according to the Broward County Court of Clerks. Each case was dismissed and he was not convicted or found liable. In 1999, LeBron was arrested in Broward County for battery on a community college security officer and theft of less than $300. He also was charged for theft between $100 and $300, according to the Broward County Court of Clerks. In 1994, when he was 22, he was arrested for possession and selling cocaine, according to court records in Marion County, Indiana. He also pled guilty to cocaine possession in 2004 in Marion Superior Court in Indiana. The second component of this story is even more troubling, as McMurphy presents the possibility that Leah’s cancer was either exaggerated or manufactured to allow TreVon to transfer without any media scrutiny being drawn to his clash with Smith, also allowing TreVon to play this season instead of sitting out a season. Below is how McMurphy presents it. According to the American Cancer Society, “stage IV epithelial ovarian cancer has spread to distant sites, like the liver, the lungs, or bones. These cancers are very hard to cure with current treatments, but they can still be treated. The goals of treatment are to help patients feel better and live longer. Lee P. Shulman, chief of Obstetrics and Gynecology-Clinical Genetics and a professor of Obstetrics and Gynecology at Northwestern University, said the outlook for an individual in this condition would be poor. McMurphy is, at the very least, raising an eyebrow here, with no insight whatsoever that it’s quite an outlier that Leah is not dead. She’s either miraculously beaten cancer, or something amazingly sinister is going on here, which would require major ethical or procedural breaches by the Grimes family, Ohio State, the NCAA, the University of Florida, and potentially involved medical parties and insurers. I mean, is this really a branch you want to stand on without any firm evidence here? Imagine being a “hero for women” then writing a story claiming a kid’s mom lied about having cancer because you want to get a football coach fired. There is some additional smoke here, considering that Meyer, Smith, and a contingent of players traveled to Florida to meet with Grimes and dissuade from him transferring. Perhaps, that’s where this potential conspiracy to get Grimes away from Ohio State under the cover of a cancer diagnosis took root. There are certainly many more plausible explanations, but if you’re going to go out on this branch, I guess you kind of have to throw that in there as well. After more what you could call either dogged reporting or badgering, this statement was provided to McMurphy. To be fair, everything in McMurphy’s story is possible. There really isn’t anything you could write about Zach Smith these days that would come off as unrealistic, given what we now know and how he acts on Twitter. And I guess it’s possible there was a far reaching plot to fake a cancer diagnosis so TreVon’s playing career could continue in the smoothest way possible. But ultimately, this is a story that is shoddily duct taped together by one person with a very checkered background, whose known contact with his son is 15 minutes of calls and a possible night out at a B-Dubs. Given the gravity of both allegations, it’s not nearly enough to publish, and that’s a takeaway that is coming from all corners of the internet and not just the Ohio State eco-chamber. I’m not surprised that Brett McMurphy has no journalistic integrity, but I am a little surprised that @WatchStadium allows him not to. “Stadium has an editorial team that we utilize on all of our written content, in addition to consulting with legal counsel.” – Adam Anshell, Managing Director, Operations. I'm not sure if I could name an editor in the country that would run that McMurphy story. 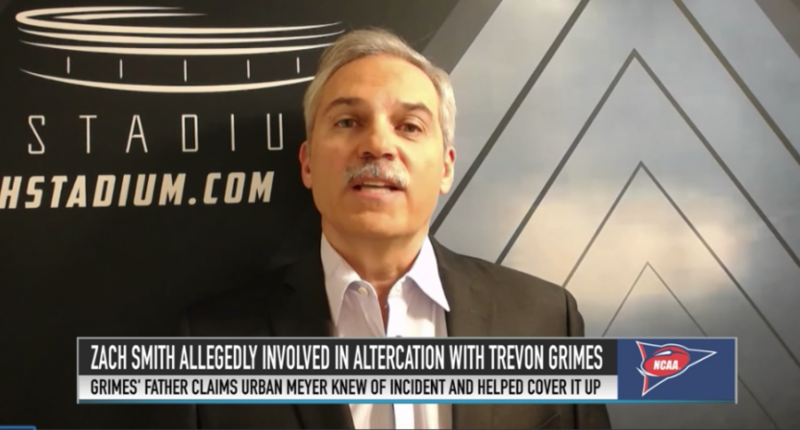 "If Urban Meyer was no longer the coach at Ohio State, I wouldn't have reported this," – Brett McMurphy. McMurphy also said he has no personal vendetta against Urban Meyer. Any Ohio State scandal, or possible scandal, is a major story. McMurphy has hovered over the program since this summer, but returns on his reporting here have continued to have shrinking returns while facing increased criticism on his reporting. Today’s article certainly did little to reverse that trend, and now that he’s no longer publishing these stories on his personal Facebook page, criticism of McMurphy has now been extended to Stadium as a whole and how they could publish such a half baked piece touching on serious allegations with minimal amount of corroboration. Any attention and any spike of views is good for any media upstart, but you have to wonder if today’s article did more harm than good given how this article has been received and how adamantly it’s being refuted. Perhaps McMurphy will gain vindication down the road on this story, but until then, this is a story that seems to have waded into murky waters usually reserved for fringe blogs and message boards.